This article is about Donkey Kong's appearance in Super Smash Bros. Ultimate. For the character in other contexts, see Donkey Kong. Donkey Kong (ドンキーコング, Donkey Kong) is a playable character in Super Smash Bros. Ultimate. He was confirmed on June 12th, 2018. Donkey Kong is classified as fighter #02. 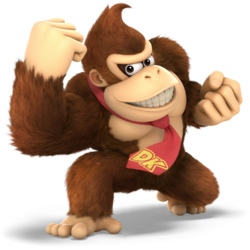 Donkey Kong retains his realistic gorilla grunts from Super Smash Bros. 4, although they are slightly less animalistic. Even though he was already considered one of the best super heavyweights in Smash 4, Donkey Kong has received a mix of buffs and nerfs, being greatly buffed overall, particularly in his off stage game. Giant Punch no longer makes him helpless when used in air, giving him a new edge guarding option and improvements to his forward throw give him a lot more options out of grab. However, cargo up throw now has more knockback which, while having great kill potential, severely hampers DK's infamous kill confirm of cargo up throw to up aerial. This, along with the nerf in rage, worsens Donkey Kong's kill power when the opponent is at earlier percents. As with all veterans returning from Smash 4, Donkey Kong's model features a more subdued color scheme. His fur is less detailed, and his facial proportions have been tweaked. Donkey Kong's nose is now based on the design from Mario Party 10 onwards. Like most of the returning roster, Donkey Kong has become much more expressive than in the previous games. Donkey Kong now faces the foreground at an angle, instead of facing directly forward. In addition, most of his animations are now mirrored while some are slightly altered, such as his walk/dash animations. Up taunt has a slightly altered animation. Donkey Kong now hangs onto the ledge with one hand instead of two. Donkey Kong's hand shaking victory pose has an altered animation. He now looks at the camera at the freeze frame and shakes his hands as opposed to his whole body afterwards. Like all characters, Donkey Kong's jumpsquat animation now takes 3 frames to complete (down from 6). Donkey Kong is heavier (122 → 127). However, he is no longer the second heaviest character in the game (claimed by King K. Rool) but instead tied with King Dedede for the third heaviest. Donkey Kong walks slightly faster (1.3 → 1.365). Donkey Kong runs faster (1.7031 → 1.873). Donkey Kong's initial dash speed is faster (1.6 → 2.09). Donkey Kong's air speed is slightly higher (1.15 → 1.208). Donkey Kong's traction is much higher (0.0529 → 0.123). Donkey Kong's gravity is slightly lower (0.08505 → 0.085). Forward roll grants less intangibility (frames 4-16 → 4-15) and has more ending lag (FAF 30 → 31). Back roll has has more startup (frame 4 → 5) and ending lag (FAF 30 → 36). Spot dodge has less startup (frame 4 → 3) and ending lag (FAF 29 → 27). Spot dodge grants less intangibility (frames 4-19 → 3-17). Air dodge grant more intangibility (frames 4-29 → 4-32). Air dodge has significantly more ending lag (FAF 35 → 49). The first hit transitions into the second hit faster (frame 11 → 8). The second hit comes out faster (frame 6 → 4), which alongside the previous change allows it to connect better from the first hit. However, its total duration remains unchanged, giving it more ending lag. Forward tilt has less startup (frame 8 → 6) and ending lag (FAF 38 → 35). It deals less damage when angled up (11% → 9%) and not angled (10% → 8%). It grants much less intangibility on Donkey Kong's arm (frames 7-11 (up), 1-25 (forward, down) → 6-9 (all)), now being in line with the duration of the hitboxes. For all angles, forward tilt has higher base knockback, but lower knockback scaling. This makes it safer on hit at low percents, but hinders its KO potential. Up tilt deals less damage (11%/10%/9% → 10%/9%/8%) without compensation on knockback, hindering its KO potential. Down tilt has less startup lag (frame 7 → 6). It has more ending lag (FAF 23 → 25). It grants much less intangibility on Donkey Kong's arm (frames 1-9 → 5-7), now being more in line with the duration of the hitboxes. The hitboxes on Donkey Kong's arm deal less damage (7% → 6%) without compensation on knockback. However, this allows them to trip opponents for longer. Dash attack has less ending lag (FAF 42 → 35). It deals more damage (10% → 12% (clean), 8% → 9% (late)), with knockback compensated. Forward smash deals more damage (20%/19% → 22%/21%), with knockback partly compensated. Up smash deals more damage (18% → 19%) and has increased base knockback, improving its KO potential. All aerials have less landing lag (17 frames → 11 (neutral), 29 frames → 17 (forward), 18 frames → 11 (back), 25 frames → 15 (up), 24 frames → 14 (down)). The removal of teching for grounded meteor smashes improves the combo potential of Donkey Kong's forward and down aerials onstage, compounded further by their reduced landing lag. Forward aerial's hitboxes last one frame longer (frames 18-22 → 18-23), allowing them to reach farther below Donkey Kong. It has a slightly altered animation, with Donkey Kong spinning at an angle after performing a downwards punch. Up aerial grants less intangibility on Donkey Kong's head (frames 1-10 → 5-10), now being more in line with the duration of the hitboxes. All grabs have increased ending lag (FAF 31 → 39 (standing), 39 → 47 (dash), 37 → 42 (pivot)). All grabs have slightly reduced range. Dash and pivot grab have slightly more startup lag (frame 10 → 11 (dash), 11 → 12 (pivot)). Pummel deals less damage (2.1% → 1.6%). It has much less startup (frame 9 → 2) and ending lag (FAF 16 → 8), but deals considerably more hitlag (4 frames → 15), increasing its effective duration. Relative to the rest of the cast, Donkey Kong's pummel is among the slowest but most damaging, rather than average on both accounts. Its animation has been slightly changed. Donkey Kong now chops the opponent's body rather than their head. Donkey Kong's throws are no longer weight-dependent. This improves their combo potential on heavyweights, but reduces it on lightweights. Cargo throw now involves Donkey Kong hauling the opponent over his shoulder, similar to his appearance in the arcade Donkey Kong game. It also more closely resembles his carrying animation from Donkey Kong Country Returns and Donkey Kong Country: Tropical Freeze. Cargo forward throw deals more damage (10% → 12%) without compensation on knockback, improving its KO potential. Cargo back throw deals more damage (12% → 13%) and knockback, allowing it to KO middleweights under 175% from the ground. Cargo back throw has a new animation: Donkey Kong holds the opponent with both hands by the legs and hurls them behind himself. Cargo up throw deals more damage (10% → 12%) and knockback, allowing it to KO middleweights under 200% from the ground. It also has increased combo potential at low to mid percents when used on the ground, due to Donkey Kong's faster jumpsquat and jump speed. Its increased knockback noticeably worsens its combo potential, especially into up aerial, no longer leading into guaranteed KOs off the top blast line except if initiated on platforms. Cargo down throw has a new animation: Donkey Kong now performs a bearhug instead of throwing the opponent downward. Cargo down throw deals more damage (7% → 11%), with its knockback scaling somewhat compensated. It grants Donkey Kong a slight boost upwards if used in the air, increasing its offstage utility. It has increased base knockback, removing its ability to chain grab opponents on moving platforms (such as Smashville's) or against walls, while still lacking KO ability at realistic percents. Down throw releases the opponent earlier (frame 24 → 19), with its total duration reduced as well (FAF 60 → 55), making it harder to DI in time. Edge attack deals more damage (8% → 10%). Giant Punch has less lag when charge-canceled by shielding (8 frames → 4), making it safer to charge. It can now also be charge-canceled by jumping or spot dodging, with the same amount of lag beforehand. However, this lag now applies to rolls out of the move as well, instead of them being immediate, making it riskier to charge-cancel by rolling. The move reaches its full charge faster (154 frames → 131). It no longer causes helplessness when used in the air, much like Smash 64. It no longer has a hitbox on frame 18 that hits behind Donkey Kong. Uncharged Giant Punch deals less knockback. Donkey Kong now charges Giant Punch with either arm due to his mirrored stance. Previously, Giant Punch was charged with his right arm in Smash 64 and his left arm in the other games. Donkey Kong now charges up Giant Punch with more circular arm motions. Additionally, his expression slowly gets angrier as he charges (including maintaining the expression throughout other animations after its charge), and he has an altered pose upon using the punch. Trails of electricity now appear on Donkey Kong's arm and fist during the charge up and punch of the move, reminiscent of Lightning Punch, one of Donkey Kong's custom moves in SSB4. A fully charged Giant Punch triggers Special Zoom. Headbutt now has super armor on frames 5-14, allowing it to tank through opposing attacks. It has one frame less ending lag (FAF 64 → 63). Spinning Kong's loop hits connect more reliably, especially for the aerial version. The grounded version's loop hits now hold the opponent in place rather than knocking them back and fourth. The move has less landing lag (40 frames → 38). The aerial version now has a final hit that launches opponents away with more knockback, improving its utility. The grounded version has more ending lag (FAF 93 → 105). Both versions of the move deal less total damage, most significantly the aerial version (17.5% → 16% (grounded), 36% → 19% (aerial)). The grounded version deals more damage on its loop hits (1.3% → 1.4%), but less on the first hit (7% → 5%), and the aerial version has 14 hits instead of 8, but they deal drastically less damage (10% (hit 1), 5%/4% (hits 2-5), 2% (hits 6-8) → 5% (hit 1), 1% (hits 2-13), 2% (hit 14)) and have inconsistent timing, only dealing full damage to opponents that are very close to Donkey Kong. Donkey Kong now glints and strikes a pose upon ending a grounded Spinning Kong, doing another spin before coming to a full stop. Aerial Spinning Kong travels a shorter distance horizontally, but also goes slightly higher overall. Unlike Grounded Spinning Kong, the aerial version no longer produces a visual "blue ring" effect upon startup. Grounded Hand Slap has less startup (frame 18 → 15). Both the grounded and aerial versions have drastically less ending lag (FAF 75 → 58 (grounded), 62 → 50 (aerial)). The aerial version has significantly less landing lag (30 frames → 10), greatly improving its ability to set up combos and tech-chases. Donkey Kong now has a new Final Smash called Jungle Rush that comprises of a single punch that, if successfully landed, leads to a series of rapid punches that traps and launches the opponent. The move, alongside the comical bongo noises it produces, are based off Donkey Kong's attacks in Donkey Kong Jungle Beat. Donkey Kong was affected in 1.2.0. However, the changes are currently unknown. Giant Punch has more range, no longer missing opponents up close. 4% A hook followed by an uppercut. 9% A backhanded slap. Can be angled to deal more damage. 10% (arm), 9% (elbow), 8% (hand) An overhead arcing swipe. It deals more damage and knockback if the target is hit near DK's shoulder. Slouch Slap 6% A crouching swat. It has a chance to trip opponents. 12% (clean), 9% (late) The Roll Attack, his signature attack from Donkey Kong Country. It deals less damage towards its end. 22% (hands), 21% (arms) A lunging clap. It deals slightly less damage if it hits with Donkey Kong's arms. 14% (arms), 17% (early, fists), 18% (late, fists) Raises his arms overhead and then quickly swings them downward to perform forearm clubs. 11% (clean), 8% (late) Quickly spins around to perform discus clotheslines with both arms, similarly to Spinning Kong. 16% (clean), 15% (late, hands), 13% (late, arms) A double axe handle. If sweetspotted, the opponent is meteor smashed. One of the strongest meteor smashes in the game, KOing at around 35%. It appears similar to his midair attack from Donkey Kong 64, which itself was inspired by this attack due to SSB debuting before Donkey Kong 64. 13% (clean), 8% (late) A back kick. 16% (foot), 13% (leg) A stomp. Its sweetspot is a strong meteor smash, while its sourspot, which is close to Donkey Kong's chest, deals diagonal knockback. 1.6% A slap. A fairly fast pummel. Kong Karry 12% (forward, up), 13% (back), 11% (down) Hauls the opponent on his shoulder, allowing him to move and jump around while still holding the opponent. This gives him access to forward, back, up, and down throws that are distinct from his normal grabs. Forward: Launches foes away from DK at a high angle. Back: Heaves the opponent backward using both hands, launching them at a slightly higher trajectory. Up: Heaves the opponent upward. When the opponent is too damaged to escape in time, all of these throws allow for easy stage spikes. Donkey Kong can simply walk off the edge, pull back and throw them against the underside. However, this carries significant risk, as the opponent can tech it and thus result in DK ending up too far below the edge to recover if his timing is off. 11% Flings the opponent backward. DK's most damaging throw, it KOs even the heaviest characters in the game below 170% near the edge without rage. 9% Heaves the opponent upward with one arm. 7% Shoves the opponent into the ground with one arm. It launches opponents horizontally in front of DK. 7% Performs a swat before getting up. 7% Claps behind himself and then in front of himself before getting up. 5% Throws a spinning, wind-up punch while getting up. 10% Performs a forearm club while climbing up. Giant Punch 10% (uncharged), 28% (tenth wind-up/fully charged grounded), 25% (tenth wind-up/fully charged aerial) A wind-up punch which fully charges after ten wind-ups. When fully-charged, the punch deals excellent damage, grants super armor, and is overall faster than if used uncharged. Its charge can charge canceled and saved, and chosen when to be released after being fully charged. DK will lose his midair jump if he uses the attack in the air. Headbutt 10% (grounded/sweetspot aerial), 8% (sourspot aerial) A headbutt. The move buries the opponent, who will remain submerged longer if the opponent has already dealt a fair amount of damage. The aerial version will meteor smash the opponent if they are hit by its sweetspot. The move has super armor from the startup until the hitbox appears. It has a deceptively large range and high shield damage, so full power shields will barely manage to avoid breaking against this move. Spinning Kong 5% (grounded hit 1), 1.4% (grounded hits 2-6), 4% (grounded hit 7), 5% (aerial hit 1), 1% (aerial hits 2-13), 2% (aerial hit 14) Rapidly spins around, trapping opponents and damaging them with a series of discus clotheslines and spinning backfists before launching them. Hand Slap 14% (ground), 5% (midair hit 1), 6% (midair hit 2) Slaps the ground to cause earth-shaking vibrations. When grounded, Donkey Kong can keep pounding by repeatedly pressing the special button. The attack gives him some protection from opponents while grounded and has good range, but is unable to KO until extreme percentages due to its very low knockback growth. In midair, Donkey Kong will perform two midair slaps, the second hit being a powerful meteor smash that combos from the first slap. Originates from Donkey Kong Country. Jungle Rush 12% (initial hit), 1.2% (rapid hits), 14% (final hit), 61.9% (maximum) Punches forward. If the initial hit connects, Donkey Kong will then perform a long series of rapid punches. Bursts out of a DK Barrel, rolls thrice, lands and strikes a flexing pose. Up Taunt: Beats his chest rapidly while scowling. Side Taunt: Shakes himself as if he is drying off, with a humorous expression. Down Taunt: Faces the camera and shrugs, while making a humorously shocked expression. Makes a cross-eyed expression, as if trying to stare at his own nose. Fist claps his hand, and makes a rotational shoulder stretch. Holds his hands above his head and shakes them. A cover of the short track that plays in Donkey Kong Country and subsequent games whenever a playable Kong defeated a boss or completed a bonus game. HIKARU - Still plays Donkey Kong as one of his strongest characters. Placed 13th at Sumabato SP 2 and 3rd at Umebura SP 2. Konga - One of the best Donkey Kong players in the world. Placed 3rd at Don't Park on the Grass 2018. Currently ranked 3rd on the Washington Power Rankings. Tweek - Uses Donkey Kong as a secondary and is considered to be the best Donkey Kong player in the world. Placed 1st at Glitch 6 and Let's Make Moves while using him with his other characters. Donkey Kong's path chronicles Donkey Kong traveling from his home to New Donk City via plane. After defeating Diddy Kong, he becomes Donkey Kong's partner for the rest of the mode. Credits roll after completing Classic Mode. Completing it as Donkey Kong has "Donkey Kong Country Returns (Vocals)" accompany the credits. Note: Every stage until Round 6 plays a track from the Donkey Kong universe, no matter what universe the stage originates from. Note 2: On Intensity 7.0 and up, Crazy Hand is joined in the battle and the music "Master Hand / Crazy Hand" is played instead. Each character can be unlocked by clearing Donkey Kong's Classic Mode, or the Classic Mode of any preceding character, if all preceding characters have been unlocked. Once all the above characters are unlocked, clearing Classic Mode with any of them will default to Mario's character unlock tree, starting with Sonic. Donkey Kong was among the fighters that were summoned to fight against the army of Master Hands. During the opening cutscene, Donkey Kong was present on the cliffside when Galeem unleashed his beams of light. Galeem's light beams vaporized Donkey Kong offscreen, placing him under Galeem's imprisonment along with the other fighters, excluding Kirby. He can be rescued in a jungle segment of the Light Realm, on a space that looks like the treehouse where he lives on his series. Donkey Kong's Fighter Spirit can be obtained by completing Classic Mode. It is also available periodically for purchase in the shop for 500 coins. Unlocking Donkey Kong in World of Light allows the player to preview the first spirit below in the Spirit List under the name "???". As a Fighter Spirit, it cannot be used in Spirit Battles and is purely aesthetic. Each Fighter Spirit has an alternate version that replaces them with their artwork in Ultimate. Additionally, Donkey Kong makes an appearance in a few Primary and Support Spirits. Goomba Super Mario series •Tiny Donkey Kong Team (×5) Neutral 1,800 Mushroom Kingdom (Battlefield form) N/A •Defeat an army of fighters Ground Theme - Super Mario Bros.
Donkey Kong grabbing on Kongo Falls. Charging Giant Punch before a Banzai Bill on Princess Peach's Castle. Taunting with Diddy Kong on Great Bay. Falling next to Kirby on Gaur Plain. Performing his down smash on Boxing Ring. Performing Spinning Kong on Skyworld. Taunting with Diddy on Distant Planet. Headbutting Mario on Gaur Plain. Idling with Ditto on Battlefield. Captured by Kapp'n on Bridge of Eldin. With Mario, Link, Samus, Ice Climbers, Pit, Villager and Inkling on Battlefield. Donkey Kong and Joker's Classic Mode routes are the only time in the Super Smash Bros. series where Master Hand is not fought on the respective game's Final Destination, not counting the Master Hand glitch in Super Smash Bros. Melee. This page was last edited on April 21, 2019, at 11:51.